If the motorsport season is over all too soon, once the last F1 race takes place at the end of November, then fear not – the Race of Champions will be staging its eighth annual event to keep things going just that little bit longer. This year’s competition is due to be held at the Commerzbank-Arena in Frankfurt (also known as the Waldstadion), one of the country’s largest stadia and capable of housing more than 50,000 spectators. A venue during the 2006 football World Cup, it is the home of Eintracht Frankfurt football club, and will be the second successive German venue to host ROC following last year’s event at Düsseldorf’s ESPRIT arena. The annual end-of-season competition brings together drivers from motorsport disciplines including Formula 1, world rally, touring cars, Le Mans and NASCAR and pits them against each other in identical machinery. Drivers pair up for the ROC Nations Cup, this year scheduled for Saturday December 3, before the individual Race Of Champions takes place on Sunday December 4. The arena will house a specially-constructed tarmac track with two parallel lanes and a fully-closable roof will guard against seasonal weather. Once again the home team will consist of Michael Schumacher and Sebastian Vettel, the first drivers to sign up for 2011, as they bid to win the ROC Nations Cup for a record fifth year in a row. Vettel said: “After winning the world championship there were a lot of emotions and pictures in my head that I will never forget. One was racing at the Race Of Champions in front of my home crowd and to win the ROC Nations Cup with Michael for Team Germany. “So I enjoyed it a lot, up to the point where I got beaten in the semi-final of the individual event! Every year I get a little further. First I made it to the round of 16, then the quarter-final, then the semi-final. Schumacher added: “It’s important to us to be in our home country so we’re really looking forward to throwing some beautiful cars around the Frankfurt circuit in December. “Last year it was a great atmosphere. You’re so close to the fans that you can hear them even though the engines are noisy. And I’m sure it will be even better in Frankfurt. “We have a strong line-up in the ROC Nations Cup but no doubt the other nations will have plenty of motivation to finally beat us. Last year’s RoC line-up included the WRC’s Sébastien Loeb, Le Mans star Tom Kristensen, F1’s Heikki Kovalainen, BTCC’s Jason Plato and WTCC’s Andy Priaulx as well as motorsport legend Alain Prost. However the individual champion’s title was taken by Portugal’s Filipe Albuquerque, who defeated Vettel in the semi-final and Loeb in the Grand Final by fractions of a second. 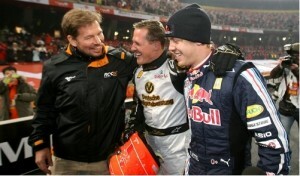 Race organiser Fredrik Johnsson said of RoC 2011: “With German superstars Sebastian and Michael in the line-up, we’re more than happy to be returning to their home ground. For further details and ticketing information, visit the event website here. Categorised under Events, tagged under Race of Champions.